Cathy Isom has some ideas than may help us in fighting the signs of aging skin with Avocados. That’s coming up on This Land of Ours. We know that Avocados are a healthy fat good for our diet. Avocados are one of the best anti-aging foods you can eat AND also use in your beauty routine. While you might not have thought to purchase this brilliant green fruit for your natural lifestyle options, you might want to reconsider. Avocados contain chlorophyll to reduce inflammation, water to hydrate, Vitamin E to promote softness and prevent wrinkles, and gentle fibers that can also help a natural mask made from avocados stick together. Avocados can be applied as a mask for your skin and you can either use them plain, or mix them with other healthy ingredients. For an avocado anti-aging mask that will reduce inflammation, help with redness and also fight wrinkles, mix 1 ripe avocado with 1 teaspoon of coconut oil, apply to face and leave on for 30 minutes. Or an anti-acne youthful avocado mask. Mix 1 ripe avocado with lemon juice from one lemon, and 1 to 2 tablespoons of rolled oats. Apply and leave on for 30 minutes. The avocado will help prevent dryness that can lead to acne and aging, while the oats will help soak up bacteria and also reduce inflammation. Or for an indulgent spa-worthy avocado mask to help fight aging, mix 1 ripe avocado, 1 teaspoon of organic coffee grounds, 1 teaspoon of cocoa ground, 1 teaspoon of avocado oil and 1 teaspoon of coconut sugar. 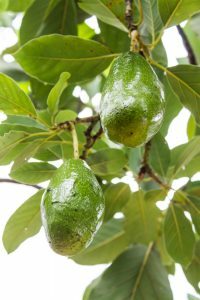 Choose between standard Haas (dark green/black) avocados or you can even use the larger, Florida-grown (bright green) avocados when is season.